Sorry it has taken me so long to get these up--we have been busy as usual. A couple weeks ago, we made a 10 hour drive for a mini vacation to visit our good friends the Smiths. It just so happens they live in beautiful Colorado and I have never been there in the summer before--it's BEAUTIFUL! Justin and Craig have been friends practically since birth and lived a street away from each other. Justin's wife Emily is the best and she and I get along like we've been friends forever, too. We have so much in common with them and they are some of our only homeschooling buddies. We commented that it's amazing how well the four of us get along and it's a shame we live so far apart. We plan to visit them again and hope to have family vacations together in the future. One of our favorite things we did was visit a strawberry farm. You could pick your own berries and eat as you went! They even had tons of other stuff you could pick and buy, too. Herbs, flowers, raspberries, and more. Avery loved picking the berries and even though she said she didn't want to eat them at first, once she tried a bite, she ate a lot! We had delicious strawberries the whole weekend! Another favorite thing about the trip was the delicious food we ate while we were there--for every meal! And we didn't eat out once. Emily is a wonderful cook and she had delicious meals planned for us! We ate a few times on the backporch and it was such nice weather! Imagine not having to turn on your air conditioner and leaving the windows and doors open almost all summer! Thanks again Justin and Emily for being great hosts and for showing us a wonderful time! We can't wait to visit again! On the way home, we stopped overnight in Kansas and picked a random Ramada Inn that was probably the cheapest hotel in the town. 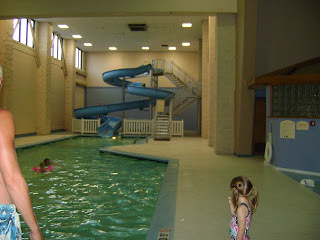 But we were surprised to find this awesome water slide with their indoor pool! Avery and Craig had an awesome time tying up the end of the vacation on the fun water slide. Yay! So fun to look back through all of the pics and remember such a great weekend. Loved all of your funny captions. How cool is that water slide?! We'll have to remember that if we ever need to stop on our way to T-town. You guys really hit the jackpot on that one!